Next time you fire up the home theatre with HD-DVD, or Blu-Ray, or whatever technical marvel you might have access to, think of those humble beginnings in movie collecting, as illustrated here. 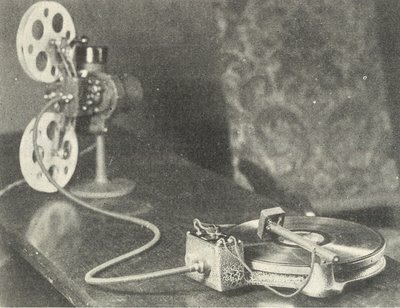 The 16mm projector and turntable unit above was introduced in 1929. It was a sort of crude Vitaphone set-up wherein you could synchronize your own record pictures on the living room screen. There were later experiments along these lines. A company called Americom offered 8mm subjects along with a record to be played on a turntable and (hopefully) in tandem with images on your wall. Take it from me, it seldom worked. You had to play the film at precisely 16 frames per second and set your needle down at exactly the right moment to have any hope of a properly synchronized show. One out of twenty times, it might work, and even then, the voices and images would drift away from each other as the 200-foot reel ran down. 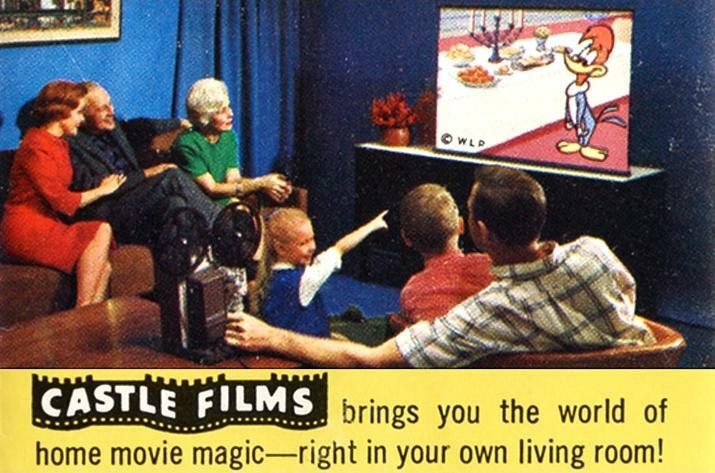 The competing Castle films, with their magnetic sound tracks, were much to be preferred. What frustrated lives we 8mm collectors led! I N T E R M I S S I O N .
This was followed by more title footage explaining that you should proceed as before and "start projector on tone." There was something very novel and exciting about the Americom experience. Every Laurel & Hardy film collector I know bought one or more Americom prints 35 or 40 years ago... and none of us has ever parted with them. I thank a merciful Providence that I didn't know about these Americom products 40 years ago, when I made my first halting baby-steps into collecting; it would have tortured me that I couldn't quite afford them. As it was, I had to make do with an ancient rattling Kodak 8mm projector that I picked up at a thrift store for fifteen bucks, a far steeper price than it sounds now. It came in a plywood carrying case and must have been one of the very first 8mms on the market. I think the serial no. was about 12, and in operation it would heat up to approximately 6,000 degrees Kelvin; people sitting twenty feet from it would be sweating like stevedores halfway through the evening. My first prints were two 8mm silent features from the venerable Griggs Moviedrome, The Lost World and The Phantom of the Opera. For music I simply dropped the needle on a more-or-less appropriate LP and hoped for the best; I still cherish the memory of one night when the unmasking scene from Phantom came off to a gloriously thundering instrumental Puccini crescendo. For Lost World, the soundtrack album to How the West Was Won did very nicely. Sentimental me, I still have those prints packed away somewhere, even though both titles are also in my collection in sparkling new DVDs -- Phantom complete with Technicolor inserts and World restored to 93 min., both with full orchestral scores in 5.1-channel stereo. Of course, I couldn't get a dime for the 8mms on eBay, but I don't think I could ever let them go in any case; they got me through some pretty lean times. Scott and Jim --- Wonderful collecting memories from you both. Thanks for sharing them. "You had to play the film at precisely 16 frames per second and set your needle down at exactly the right moment to have any hope of a properly synchronized show." I'd seen the Americom titles in my 8mm past, but I always avoided them - not because I didn't think I'd be able to synch 'em up, but because I figured it'd never work due to my projector's speed. I just assumed the film would have to travel at 24fps, same as any talkie. Based on your comment quoted above, that's apparently not true - so my question is: what did these things SOUND like? When I'd buy Atlas Films' 200-foot adaptations of Laurel & Hardy two-reelers, the silent versions of sound shorts always moved at a funereal pace - because I was running them at 16fps, and they were transferred at 24. If Americoms were designed to run at 16fps with sound, then I imagine either the transfer managed to eliminate 8fps (and how is that done without making the action seem jerky? ), or the soundtrack was terribly slow. Inquiring minds... well, you know. Hi Michael --- As I recall, the records played s-l-o-w. They never sounded natural to me, but the novelty of sound movies overcame some of that --- what really killed the experience for me was the virtual impossibility of getting the things to synch up. 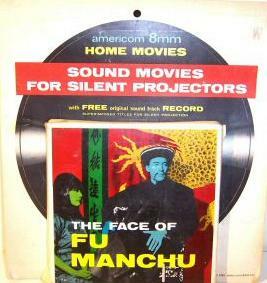 The Americom soundtracks were stretched to accommodate the 18-fps 8mm speed. They somehow inserted nanoseconds of blank space throughout the track, so while the picture played 25% slower, the voices were still recognizable. (It wasn't like playing a 45-rpm record at 33, for example.) Boy, with these dated techno references, are we dating ourselves or what? Boy oh boy … talk about a trip down memory lane. I never knew about the WHEN COMEDY WAS KING Americom release. I got the four part VOYAGE TO THE BOTTOM OF THE SEA and all the Hammer stuff. They actually did a few sound-on-film releases (I got the 8mm HORROR OF DRACULA but it was on back-order for a year and a half. I should've just gone to 16mm for all the money I flushed down the toilet on 8mm/Super-8 crap. Geeze-Louise! And yet I'm awash with nostalgia anyway. What the hell is wrong with me? Excellent. You have a great page, man. I bought several of those Americom 8mm movies and applied magnetic sound stripe to them with the aid of a home striper. Using my Eumig 8mm sound projector for recording the sound from the disc, after many attempts at erasing and re-recording or stopping and starting I eventually managed to get reasonably good results, which were mainly achieved by manually speeding up or retarding the turntable to keep the sound in synch with the picture. Very frustrating work. My wife used to hate it because they were the only occasions that I ever lost my patience.